Covered in engine grease, hydraulic fluid or coal dust, it doesn’t seem like glamorous work but the skilled technicians who maintain some of the state’s largest machinery are being featured on the new international television series Mega Mechanics. 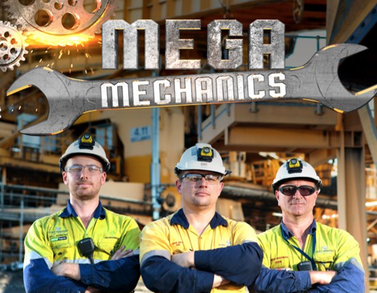 The third episode of factual television series Mega Mechanics is airing this Sunday 17 March at 7pm on 10 BOLD. The series has also been picked up internationally for extensive worldwide broadcast. Mega Mechanics went into production in 2017 with the Brisbane-based WildBear Entertainment team, led by Executive Producer Veronica Fury in association with local Director Glenn Wilkinson. “We are extremely proud of Mega Mechanics as a series, it’s already had a great reception both here and abroad,” said Veronica Fury. The series was supported by Screen Queensland and has a large Queensland focus with filming taking place all over the state such as Hasting Deering in Mackay, the New Acland Coal Mine in Oakey, the QANTAS Heavy Maintenance Hangar in Brisbane and the Rocky Point Sugar Mill near Yatala, to name just a few. The post-production team joined forces with Chop Shop Post at South Brisbane to bring the show to life and deliver the series to broadcasters around the world. Mega Mechanics airs on Sunday evenings at 7pm on 10 BOLD.